Well its Tuesday so its time for another challenge on Passion for Promarkers. This week Im Hostess and I have picked the theme Cats and or Dogs!!! Well I cant have one without the other in my wee house!!! Belle and Felix are happily really good friends. The challenge is Sponsored by Dr Digi this week and I got this fabby wee image to play with!! You can find it HERE! A super card Hazel, such a fun image and great colouring. Such a cute digi, so perfect for the sketch! 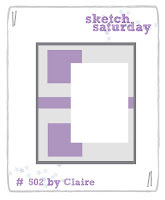 Thanks so much for playing along with us at Sketch Saturday! Thanks for joining us at INTAAS with your cute card, love the image! Hi what a super fun card,thanks for joining us here at I Love Promarkers challenge,Lyn DT x.